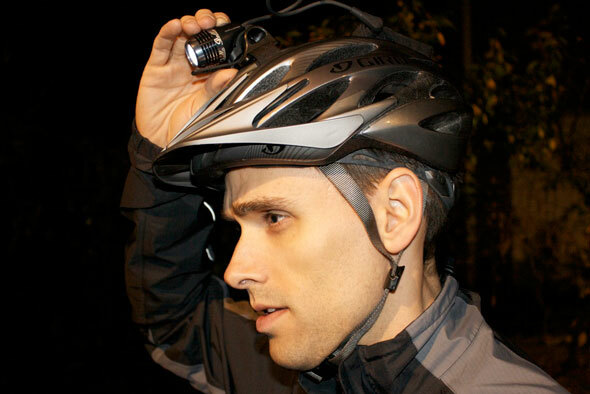 Torch's headgear doubles as an LED safety light. When it comes to nighttime bike safety, you've got your low-grade equipment like reflectors and lights. Then there's the nuclear option: a helmet armed with an army of LEDs, making the rider appear like a floating demon eye escaped from the depths of hell. The T1 Helmet, which starts at $99, is a screaming-loud visibility device developed by Los Angeles-based Torch Apparel. Unlike those helmet-mounted lights that make cyclists look like coal miners, the T1 rewrites the equation by turning the helmet itself into one big light. The headgear has illuminated panels both front and back that can switch between steady, flashing, and off cycles. Currently there are few choices for cyclists when it comes to safety equipment. While there are many products on the market, most use the same approach: Several small, narrowly focused LEDs placed close together and mounted to the center of the bike. After realizing the rider is the largest surface area on a bike, the idea quickly made sense to create the largest lit surface possible. By placing it up high in the helmet, the rider is visible over traffic and other road obstacles. The T1's light shields are made from tough polycarbonate, so there's little danger of riders' helmets exploding into electronic shards upon a wipe-out. The batteries recharge via USB, but the process takes about 90 minutes. On the plus side, the apparel company has increased the battery life to 36 hours in its upcoming T2 version, which is already available for pre-sale on Indiegogo. Bike helmet, from $99 at Torch.